Here’s the new Peavey Joe Satriani amp mentioned in my Joe Satriani interview and in a Premier Guitar interview with Hartley Peavey recently. ANAHEIM, Calif. — Peavey and Joe Satriani have collaborated to create the all-new Peavey JSX® 50 guitar amplifier head, the latest project in the Peavey JSX Series of signature amplifiers and enclosures designed with the guitar legend. Like the three-channel Peavey JSX Head and JSX Mini Colossal™ before it, the new JSX 50 aims to give guitar players a wide new tonal palette that allows them to express an abundance of sounds and styles. But that’s where the similarities end. With the JSX 50, Satriani and Peavey have redefined the classic 50-watt guitar-amp format with extensive tone-coloring tools to aid modern guitarists. The JSX 50 accomplishes this through a design that pairs five 12AX7 preamp tubes with two 6550 power amp tubes and two independent channels with three-band EQ. Both the Clean and Crunch channels feature master volume and preamp gain controls, so guitarists can adjust the interplay between the preamp and power amp on each channel for an array of gain possibilities. The Crunch channel also includes a boost switch and a six-way attack selector that adjusts the bass response. On the rear panel, a built-in Peavey MSDI™ microphone-simulated XLR direct interface eliminates the need for miking by allowing users to route the amp’s signal directly to a recording device or mixing console. Additional controls include a line out with level control; active effects loop with send/return level control; impedance selector; and a tube bias adjustment jack. The Peavey JSX 50 amplifier will be available from authorized Peavey retailers in Q2 2009. 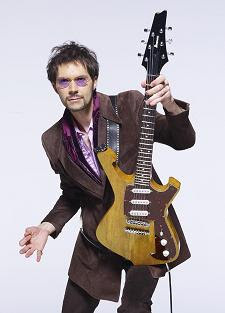 2008 is truly the year of Paul Gilbert and Ibanez. At his clinic in Geelong last year, Paul mentioned that he had been using a modified ADA Flanger for years, and that he’d suggested to Ibanez that they reissue one of their vintage flanger designs, which he said had a very similar circuit to the ADA. It seems they listened to him: they’re now releasing the Paul Gilbert AF2 Airplane Flanger. Paul’s ADA flanger had a modified feedback control to get that wild, whammy-like sweeping sound, and this pedal has the same feature incorporated. The Paul Gilbert Signature AF2 Airplane Flanger is two fantastic pedals in one rugged package. One section is a traditional chorus flange; the other is the “Taxi Take Off” flange (hence the “Airplane” moniker), which provides virtuoso guitarist Paul Gilbert’s own “crazy flange” sound, which includes shifting the pitch up and down. Time to buckle up. You can read more about the pedal over at the Random Chatter Music blog. NAMM 2009: Ibanez Paul Gilbert Fireman. The venerable Rich Harris from Ibanez Rules has confirmed in a posting on Jemsite that the much-rumoured Ibanez Fireman (reverse Iceman, geddit?) Paul Gilbert model will be released in extremely limited quantities, and it ain’t going to be cheap at $9,333.33. Rich said: “There will be 50 Fireman’s total. 45 SSS for World distribution, 18 to HUSA, and 5 in HH for Japan distribution only, probably by lottery the way they usually do. Free plug for Rich: I’ve bought a bunch of parts from Ibanez Rules over the years, and while I’ve never bought a guitar from him, his setups are legendary. 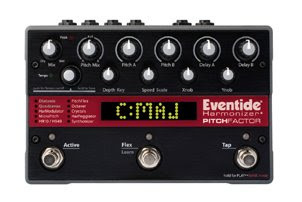 Eventide, never one to shy away from making me want to hold up a bank in order to buy everything they’ve ever made, is adding the Pitch Factor to the series of pedals that already includes the Time Factor and Mod Factor. The pedal offers up to 4 voices of diatonic pitch shifting and up to 1.5 seconds of stereo delay. It’s compatible with guitar or bass, has a built-in tuner, and is software-upgradeable via USB 2.0. And of course it’s MIDI controllable. Cheers to Kent for Tweeting about this! There those little things that make life worth living. The loving caress of one’s significant other. Watching your child take their first steps. The new Futurama movies. But let’s not forget that other of life’s sweet, sweet joys: valve amps that look like 50s TV sets. VOX Amplification introduces the AC4TV, a 4-Watt, Class A Tube Amplifier based on the popular VOX AC4 from the 1960s. The AC4TV combo, as well as the AC4TVH head version (with matching V112TV 1 x 12″ extension cabinet), is an all-tube practice amp that has been factory-modded with a premium transformer and select components for optimum tone. Improving on the hardware of its vintage counterpart, this up-to-date Class A version retains the distinctive EL84 power tube of the original and features a 12AX7 powered pre-amp, driving the AC4TV’s custom-made Celestion 10-inch speaker, and the extension cabinet’s custom-made 12-inch speaker. These features enable both models to deliver clean, crunch or wonderfully saturated overdrive for a range of sonic options that is unmistakably VOX. A challenge confronting all-tube amps is to retain a full tone at lower volumes. To solve this issue, the AC4TV and AC4TVH feature a built-in power attenuator, with 4 Watt, 1 Watt and 1/4 Watt output levels, ensuring that players never lose that classic tube tone, even at the lowest listening levels. For situations when a fuller sound is desired, the AC4TV also adds a 16-Ohm speaker output for connection to an additional cabinet, such as the VOX V112TV. Both models feature simple, elegant cabinetry with the “TV” front design first used on the classic AC15 from 1958 as well as some of today’s VOX Heritage Series models. The VOX AC4TV 4-Watt Class A Tube Amplifier will be available in February 2009 with a U.S. MSRP of $400. AC4TVH and V112TV cabinet pricing and availability are TBA. For more information, visit their web site at http://www.voxamps.co.uk/. Queensryche guitarist Michael Wilton has revealed on his official website that he is the sole guitarist on the band’s forthcoming album, American Soldier. This puts a big question mark over the head of co-guitarist Mike Stone, who has played with the band since the tour for their ‘Tribe’ album, and was on the last two, Operation Mindcrime II and Take Cover. Is Stone still playing with Queensryche? He was never an official member of the band, but he was their regular second guitarist for many years on stage and in the studio. So with this in mind, I’d like to advise Wilton that as long as I can take Mrs I Heart Guitar and our adorable 2-year-old on the road with us and we can live out our own Zippy The Pinhead strip as we visit roadside attractions between towns, I would be happy to step in as Queensryche’s second guitarist. Email me, dude. CLICK HERE to buy the ESP LTD MW-600 Michael Wilton signature model guitar from Music123. And CLICK HERE to get a 25-song, 100% free trial subscription to eMusic, where I bought the killer album by Wilton’s other band, Soulbender, last week. I’ve been looking for this album forever and it totally crushes – just check out the evil Sabbath-ish riff in the first song. Here’s the latest product of the Vox/Joe Satriani alliance: the Big Bad Wah. Satch is a renowned wah tweaker, and the first time I interviewed him he spoke for a solid 10 minutes just about wah wah pedals. So when they say the pedal has been designed to Satch’s custom specs, I imagine the notes they took during the consultation period would look like a phone book. Big Bad Wah is one in a series of pedals designed by VOX and guitarist extraordinaire Joe Satriani. The Dual-mode design offers two distinct wah sounds in a single pedal. Joe Santriani contributed numerous ideas that were unheard of in existing wah pedals, endowing the Big Bad Wah with an unparalleled range of sounds from vintage to modern, as well as those that are totally original. The heart of any wah pedal is the “inductor.” The Big Bad Wah allows you to select between a vintage UK style inductor, and the more modern USA style. Designed to Joe Satriani’s custom specs is the design of the pedal pot itself, delivering a smooth, musical tone throughout the entire sweep of the pedal. Big Bad Wah features a dual-mode design. Wah One faithfully replicates the classic VOX wah sound that conquered the world. Wah Two delivers all the wah pedal know-how that Joe has accumulated over his many years of experience. The Drive knob mimics the Wah 1 gain at its lowest setting, and delivers a 10 dB boost at the maximum settings for those aggressive, growling overtones. One of the most powerful aspects of Wah Two is the Voice switch, providing traditional wah voicing; or a dark, resonant tone reminiscent of a vintage talk-box. This is the ultimate wah pedal not just for Joe Satriani fans but for any wah pedal user who enjoys creating their own sound. Kudos to Jon from Guitar Noize for bringing this one to my attention. This one has been floating around the net for a few weeks, but I didn’t really want to post about it because unlike those guitars published on the Thomann website last month, the image of the new Jem was obtained by somewhat shady means (someone snooped around and found an Ibanez website photo directory with photos that were to be put on the 2009 website). But now it’s official and here it is: the JEM77EAFX. What do you think? Personally I love it – except for that decal. And I’m assuming it’s under the clearcoat so you’re stuck with it. It kinda defeats Vai’s original intention of keeping his name off Jems so they wouldn’t just be associated with him. The decal instantly turns this into a guitar for Steve Vai and people who wish to say loud and clear “I’m totally a Steve Vai fan,” which is cool but I’d much rather have a guitar that doesn’t scream VAI in big letters. I think this one’s a bit of a missed opportunity. The specs are pretty similar to the JEM77VBK, and I dare say that if you really want a fixed bridge Jem, you might as well just buy one of the other models and install a Tremol-No. CLICK HERE to buy the Tremol-No on eBay. CLICK HERE to see Ibanez Jem guitars on eBay.